Update: Read our full review of the Sony Ericsson K850i Cell Phone. Sony Ericsson isn't the first to come up with a 5-megapixel camera-phone and, in fact, Samsung has even higher-resolution mobiles in its pocket. And with a 5-megapixel autofocus camera and an onboard Xenon flash, some are bound to wonder if the Cyber-shot K850i can rival that of Nokia's N95. Previously, we had a quick hands-on impression of the unit at CommunicAsia 2007. This time, we're delving deeper to find out what else the K850i has to offer. Do note that this is still a prototype unit we're reviewing, so there may be differences in the commercial set when it becomes available in early Q4. When we read the specifications, we couldn't help feeling that this should have been what the K810i aspired to. Fans of the first Cyber-shot have waited for a promising successor to the K800i and were no doubt disappointed that these turned out to be chiefly aesthetic in the K810i. 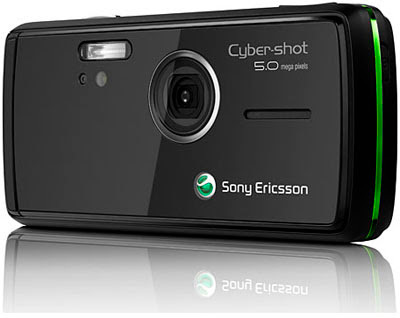 In the K850i, Sony Ericsson has not only increased the resolution from 3.2 to 5 megapixels, other less-publicized features give the K850i street cred as a camera-phone. Taking a page out of the Sony Cyber-shot book, the K850i sports a slider switch that toggles between the shooting modes and playback function. Previously, users had to access the onscreen menu to change from stills to motion images. With this new hardware switch, toggling between shooting modes is a lot easier. One of the most notable changes (we're inclined to say improvements, but there's a reason we're not) is the automatic lens cover. The company has dropped the entire mechanical lens cover on the K850i, replacing it with an automatic one. The catch is that a layer of clear plastic now protects the cover. This may be a problem when fingerprints smudges come to play. On the K810i and the K800i, sliding down the lens cover automatically activates the camera. But on this new Cyber-shot, there's a dedicated on/off button that does the job. 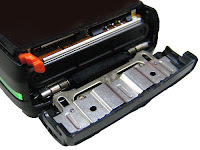 The last feature, probably also one of the most interesting and innovative ones, is the battery compartment on the K850i. 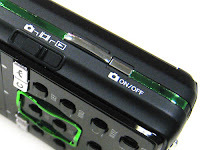 Unlike most mobile phones where changing the power cell involves removing a cover, this Cyber-shot sports a slide-out door that allows access to the battery and the SIM card. This feature may be common on standalone digital cameras, but it's definitely one of the firsts we're seeing on a camera-phone. 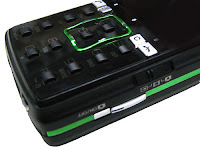 Like the K810i, Sony Ericsson has not only given the K850i a glossy front section, it has also kept the numeric keypad and Call/End buttons equally tiny. The usual directional pad is now a rectangular ring that wraps around the 2 and 5 buttons. After fiddling with our prototype unit for a few days, we felt the buttons, though tiny, weren't that difficult to use. It was a little awkward at the beginning, but ample spacing between each key helped in the typing. The experience would have been better if the buttons had provided more feedback, though. Our only quibble was accidentally hitting the directional pad when reaching for the 2 and 5 buttons. In our previous assessment, we wrote about the top row of softkeys that appear to be neither touch-sensitive nor hard buttons, which left us baffled. We have since confirmed with Sony Ericsson that the softkeys represented by three white dots are touch-sensitive and they glow in the dark, as we found out later. However, when in use, the keys will depress slightly because the screen and the keypad are separate components and the latter felt to us as if it was lying on a hollow layer. 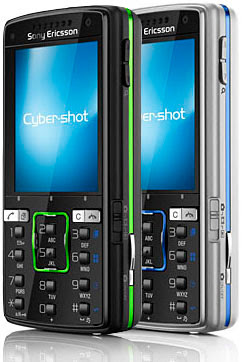 The phone's menu is similar to previous Sony Ericsson models with a 3-by-4 icon grid, tabbed browsing interface for Settings and vertical scrolling for other options. The softkeys are mapped to the applications and they show up as different options when selected. The K850i sports a slider switch that toggles between the shooting modes and playback function. 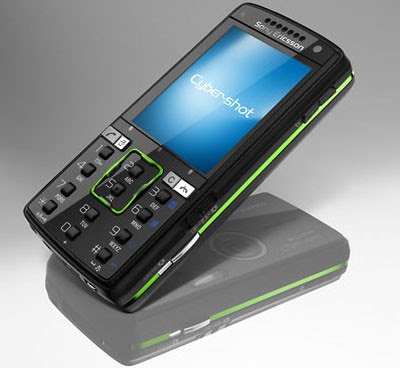 This Cyber-shot sports a slide-out door that allows access to the battery and the SIM card. One of the most radical changes is the new tree-like Media browsing interface that looks vaguely like the Sony PlayStation Portable. The Photo, Music, Video, TV and Settings icons are lined in a column. To select any of the options, we had to press right using the navigation pad. The interface just needs to be spruced up with some colors instead of the grayscale theme we're seeing now. That said, this is a prototype and things may change down the road. On the digital imaging front, the K850i has a comprehensive set of features and is comparable with some midrange digital cameras. The user can choose different image sizes, quality settings and shooting modes. There is 16x digital zoom, though at maximum telephoto setting, we expect a drop in image quality due to pixelation. The K850i also comes with autofocus, a built-in Xenon flash, selectable ISO, white balance, metering modes and a variety of scene modes to help the user along. The onboard accelerometer (Apple's iPhone also has a similar feature) keeps the pictures in the correct orientation regardless of whether we're looking at it from a portrait or landscape perspective. Other notable goodies on this Cyber-shot include a front-facing camera for 3G video calls, memory card slot that accepts both Memory Stick Micro and microSD card types, FM radio, organizer functions, Track ID, Video/Photo/Music DJ, voice recorder, RSS feed reader, Web browser and triband HSDPA connectivity. The K850i also supports streaming video clips in Netchannels which we were unable to test. 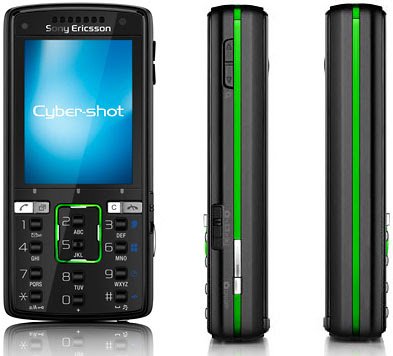 The quadband Sony Ericsson K850i will be available in Luminous Green and Velvet Blue and is expected to ship to selected Asia markets in early Q4 this year. No pricing was released.